All Sikhs should write Satpal Singh as well to encourage him to advise the Akal Takhat to tackle this important issue of Yogi Bhajan's 3HO Americans diluting Sikhi with Hindu practices like idol worship and tantric yoga. I noticed on SikhNet you have been appointed to be the convener of the new US committee for the Akal Takhat. I would like to know if you are serious about discussing the many problems in 3HO concerning their un Sikh like practices. If you haven't noticed, my videos on this subject have received support from thousands of concerned Gursikhs around the world. Let's work together to resolve these differences. Will you help mediate this situation for the good of the Khalsa Panth? 3HOers are bowing. This un Sikh like practice is done not more than 500 yards from SikhNet ! Please write these Yogi Bhajan tantric / kundalini yoga followers & direct them to Sikh Reht: Sikhs only bow to the Siri Guru Granth Sahib Ji & a Sikh never worships at the graves of the dead or bows to idols! In the video, Yogi Bhajan followers are seen worshiping, and prostrating themselves to the building where Yogi Bhajan died & bowing to a golden idol in Espanola New Mexico not more than 500 yards from the SikhNet offices and headquarters! The Sikh code of conduct specifically states that "Superstitions and rituals should not be observed or followed, including pilgrimages, fasting and ritual purification; circumcision; idols, grave worship...."
"This is not the way to meet the Supreme One and Only. I have performed these rituals so many times. Finally I collapsed, exhausted, at the door of my Creator and I prayed to the Beloved One, 'Please, grant me a discerning intellect'"." 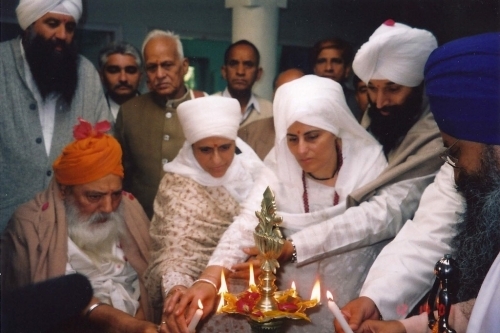 Sikh NewsNet report, ..." Yogi Bhajan's dharma, which is considered a cult by at least two US experts..."Akal Takhat committee appoints Yogi Bhajan's son-in-law, Satpal Singh Khalsa/Kohli as convener. Sikh NewsNet report on Akal Takhat committee starring Yogi Bhajan's son-in-law, Satpal Singh Khalsa/Kohli. 3HO is described as a controversial sect that has been labelled as a heretical cult: "Daljit Singh also questioned Satpal Singh Khalsa’s appointment to the committee. He is the late Yogi Harbhajan Singh Khalsa’s son-in-law and also a representative of his dharma, which is considered a cult by at least two US experts. By definition, a cult is a group of people with heretically different and schismatic beliefs from those of an established group, often with extreme devotion to its founders, and lives outside of conventional society, usually under the direction of a charismatic leader. 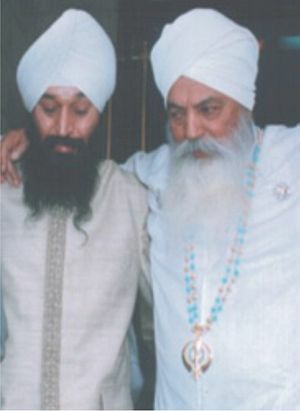 Yogi Bhajan’s dharma was founded in Los Angeles in the early 1970s, and has many practices rejected by Sikhs, which include following another guru, Yogi Bhajan, practicing white-tantric, kundalini and other yoga, establishing a different rehit maryada, forming a ministry and engaging in ritualism. Yogi Bhajan “…created a new culture of Sikhi as founded by Guru Nanak, the first Guru of the Sikhs,” his Web site, 3HOhistory.com, says. His organization, 3HO (Happy, Holy, Healthy Organization) and Sikh Dharma, appear on a list of cults identified by the Cult Awareness and Information Center. Cult expert Rick A. Ross called Yogi Bhajan an "absolute authoritarian figure,” in a 2004 obituary written in the New York Times. Waheguru Ji Ka Khalsa Waheguru Ji Ki Fateh! I have written Satpal Singh, who many of you know, is now the "convener" of a special committee for the Akal Takhat in the US about the un Sikh like practices by Yogi Bhajan's people. For those who may not be aware, Satpal is also Yogi Bhajan's son in-law. This letter below is an example of the comments I get almost daily from orthodox Sikh Reht Maryada Sikhs who are concerned about the un Sikh like practices of Yogi Bhajan's followers: From Narinder Singh, "Dear Gursant: Pl keep up your fight against unsikhi like practices of Sikhnet followers till they embrace true Sikhi and merge into mainstream Sikh Sangat. I was earlier considering like donating to Sikhnet till i came across your exposure of their "bipran ki reet". I dont think they have any future as a Sikh-they surely are destined to doom..."